Exhibition on the theme of Bedouin ownership of Negev lands and the ongoing Israeli state campaign to uproot the Palestinian Bedouin from the northern threshold of the desert. 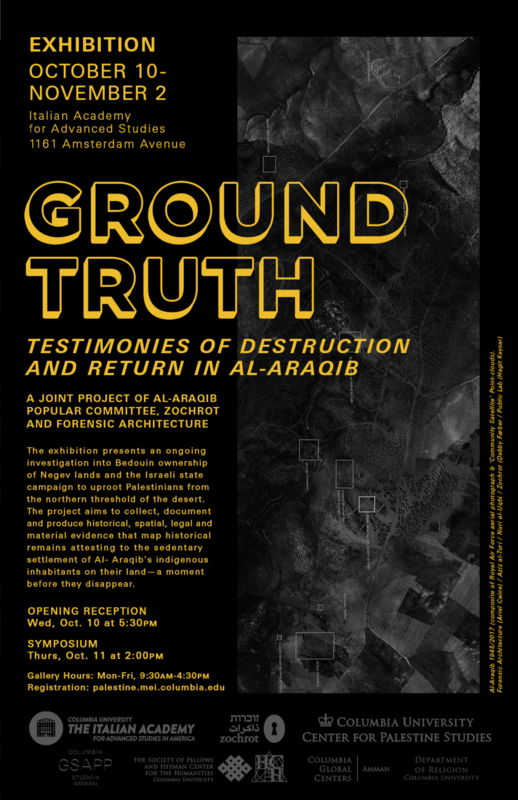 A joint project of Al-Araqib Popular Committee, Zochrot and Forensic Architecture (Goldsmiths University, UK). The exhibition presents an ongoing investigation undertaken by the inhabitants of the Palestinian-Bedouin village of Al-Araqib, Forensic Architecture and Zochrot, which aims to collect, document and produce historical, legal, spatial and material evidence that map historical remains of Al-Araqib villagers’ sedentary settlement on their land – a moment before they disappear. The term “GROUND TRUTH” refers to a process of anchoring elements of a representation to its source. Just as a satellite image analyst needs to compare pixels in an image with empirical data on the elements on the ground in order to calibrate material, colour and scale, so does this project, by aligning elements of historical and contemporary aerial photos with their equivalent elements in physical space. Thus, this exhibition highlights the ever present gap between reality and its representation, and the importance of such anchoring in testing different possible realities. The exhibition will be accompanied by an afternoon symposium on October 11th, 2018. This event is co-sponsored by Studio-X Amman at Columbia GSAPP and Columbia Global Centers | Amman, The Heyman Center for Humanities, and the Department of Religion.